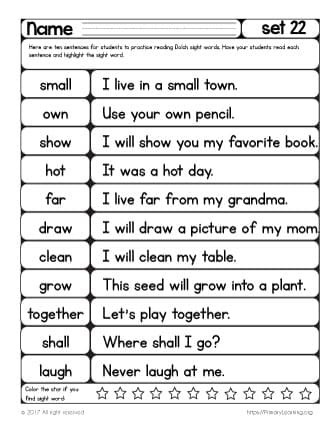 Our collection of sight words includes a variety of worksheets and hands-on activities for Preschool children through 3rd Grade. 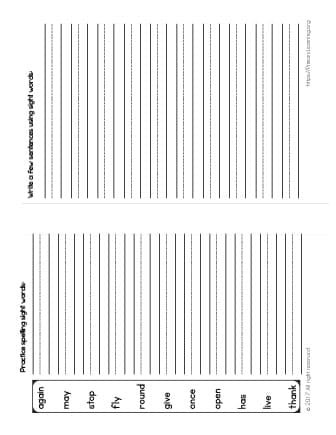 These worksheets will help your child recognize, read and write the most common English words. 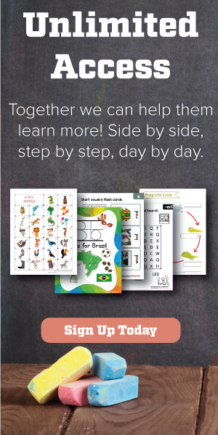 All worksheets and hands-on activities use various methods to help children recognize sight words in different contexts and avoid the simple memorization of words. 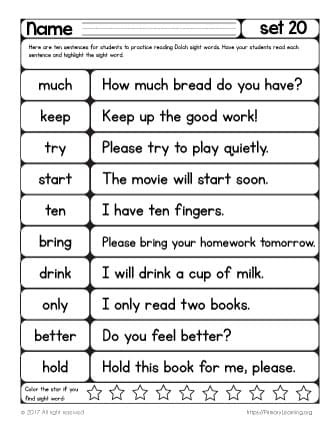 Do not overwhelm kids with multiple new words at a time. They can achieve more success when they fixed their knowledge of one or two words before being introduced to more. Do not teach visually similar words at a time. Kids easily get confused and there is a higher opportunity for errors. Make it personal. For example, a child may be excited to read and write about mom or dad. A child who loves soccer may be motivated to learn words such as “like” and “play” so he can include them into the writing. Let them use magnetic letters, alphabet tiles, or letter stamps. They can create sight words using clay or write them in the sand, on salt trays, or in shaving cream. 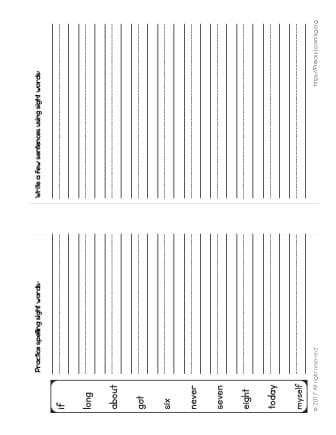 Link reading and writing. If a child can write a word, there is a strong chance that he can also read it. 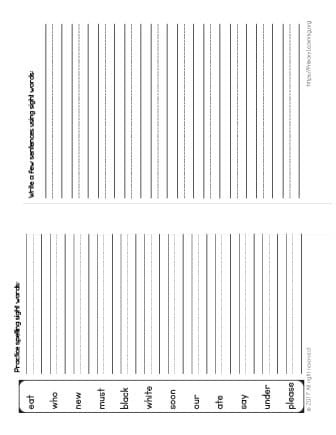 Practice short sentences that include the sight words you are focusing on. Choose texts appropriate for a child’s reading level. 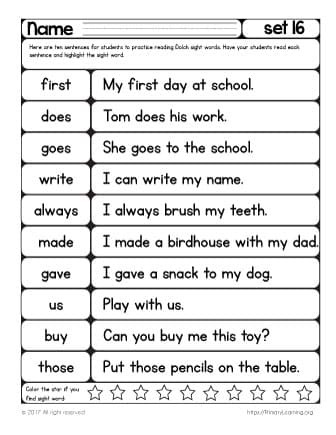 Regular exposure to sight words will help children learn them. Use “word walls” as a visual aid for children who are learning new vocabulary. 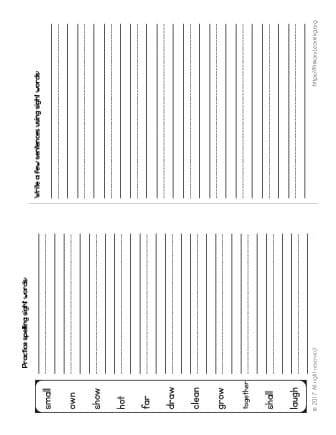 Children use the word wall to help them while they’re writing, with the end purpose of learning how the word is spelled. Use of personal dictionaries. 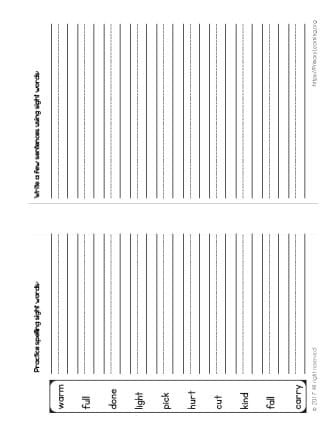 Personal dictionaries are a resource that encourages independence as children are learning to use sight words in their writing. Sight words spelling dictionary is great for independent practice. Words: best, upon, these, sing, wish, many. Sight words spelling dictionary is great for independent practice. 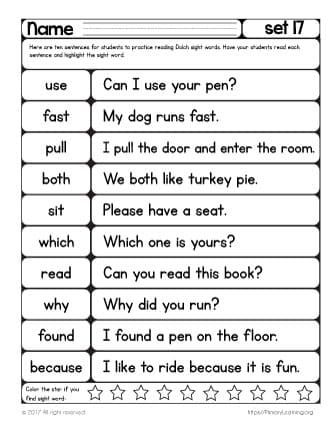 Words: use, fast, pull, both, sit, which, read, why, found, because. Spelling dictionary is great for independent practice. Words: first, does, goes, write, always, made, gave, us, buy, those. Sight words spelling dictionary is great for independent practice. 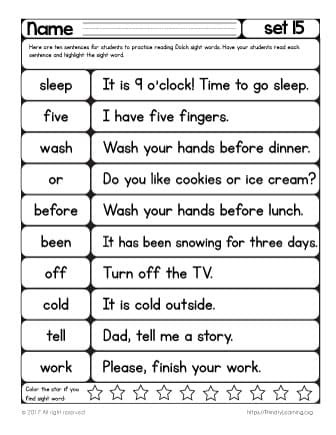 Words: sleep, five, wash, or, before, been, off, cold, tell, work. 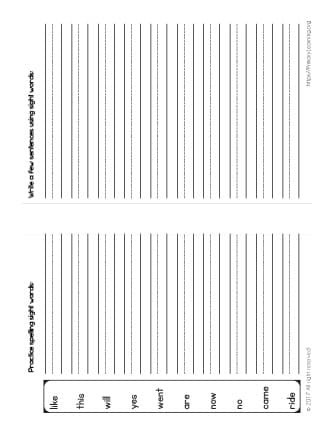 Spelling dictionary is great for independent practice. Words: would, very, your, its, around, don't, right, green, their, call. Spelling dictionary is great for independent practice. Words: again, may, stop, fly, round, give, once, open, has, live, thank. Sight words spelling dictionary is great for independent practice. 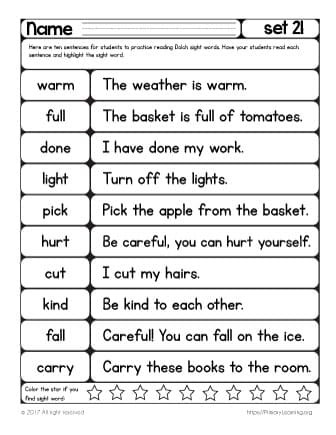 Words: put, take, every, old, by, after, think, let, going, walk. 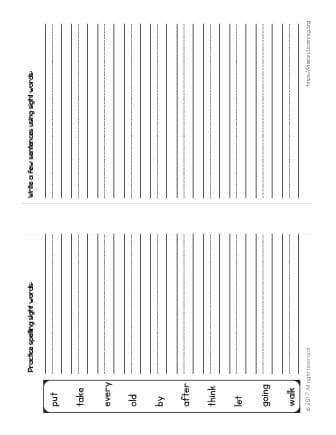 Sight words spelling dictionary is great for independent practice. Words: were, them, ask, an, over, just, from, any, how, know. Sight words spelling dictionary is great for independent practice. 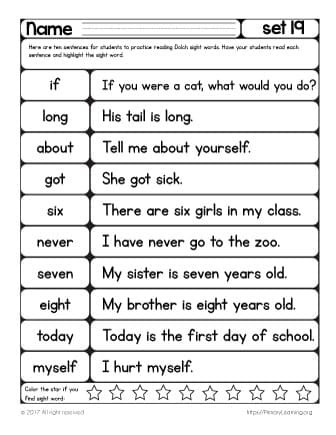 Set 10 includes: of, his, had, him, her, some, as, then, could, when. Spelling dictionary is great for independent practice. Set 9 includes: eat, who, new, must, black, white, soon, our, ate, say, under, please. Spelling dictionary is great for independent practice. Set 8 includes: into, good, want, too, pretty, four, saw, well, ran, brown. 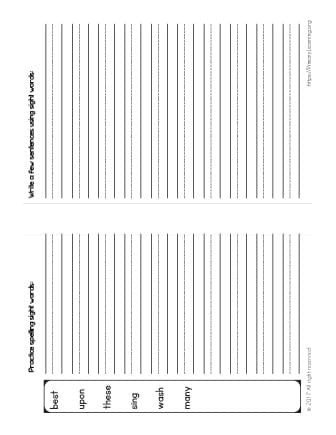 Sight words spelling dictionary is great for independent practice. Set 7 includes: like, this, will, yes, went, are, now, no, came, ride. Sight words spelling dictionary is great for independent practice. Set 6 includes: there, out, be, have, am, do, did, what, so, get. Sight words spelling dictionary is great for independent practice. Set 5 includes: he, was, that, she, on, they, but, at, with, all. Spelling dictionary is great for independent practice. Set 4 includes: here, help, make, yellow, two, play, run, find, three, funny. Spelling dictionary is great for independent practice.Set 3 includes: one, my, me, big, come, blue, red, where, jump, away. Sight words spelling dictionary is great for independent practice. Set 2 includes: up, look, is, go, we, little, down, can, see, not. Sight words spelling dictionary is great for independent practice. Set 1 includes: the, to, and, a, I, you, it, in, said, for. 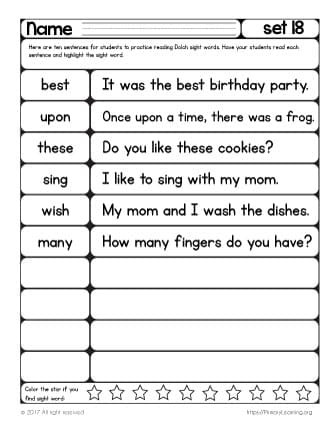 2nd Grade Dolch sight words reading practice set 18 includes words: best, upon, these, sing, wish, many. 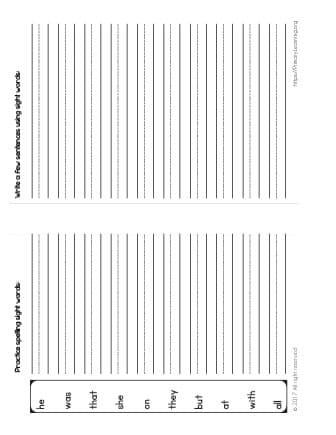 2nd Grade Dolch sight words reading practice set 17 includes words: use, fast, pull, both, sit, which, read, why, found, because. 2nd Grade Dolch sight words reading practice set 16 includes words: first, does, goes, write, always, made, gave, us, buy, those. 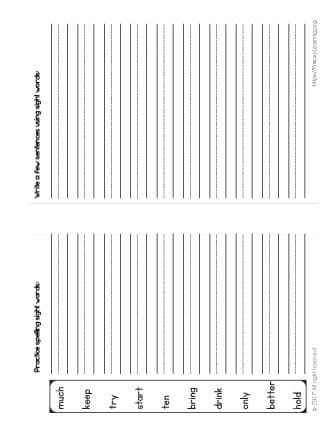 2nd Grade Dolch sight words reading practice set 15 includes words: sleep, five, wash, or, before, been, off, cold, tell, work.